There is an extensive literature concerning CPM, with more than 400 publications having this in the title in Pubmed as of 5-2009. According to Lempl, as of 2006, 174 cases of CPM have been reported in alcoholics since 1986, which is equivalent to an incidence of 39.4% (of alcoholism in CPM). Thus chronic alcoholism is still the most common underlying condition of CPM patients.Likewise, 95 cases of CPM following the correction of hyponatremia have been documented since 1986 (21.5%). The third largest group of CPM cases are liver transplant patients (17.4%), with the development of CPM being attributed to the immunosuppressive agent cyclosporine in particular. Pathologically, it is defined as a symmetric area of myelin disruption in the center of the basis pontis, although similar symmetric lesions have also been described occurring with CPM as well as independently in other brain areas (extrapontine myelinolysis or EPM) including the cerebellar and neocortical white/gray junctional areas, thalamus and striatum. Clinically, patients often are unable to move their eyes during their acute period, may be "locked in" -- with quadraparesis, and have speech disturbance. Case example 1: osmotic syndrome. a patient presented to the clinic complaining of chronic dizziness and imbalance. During a hospitalization for pancreatitis, he became hyponatremic. An MRI scan showed "poorly defined high T2 signal within the central pons". Physical examination revealed slowing of upgoing saccades and positional nystagmus. Case 2: Liver transplant. The individual shown below had a liver transplant done. After the liver transplant, he was fine for a couple of days but then gradually became comatose. His MRI at that time showed the picture above. Examination nine months later revealed an ambulatory individual with some mild cerebellar signs. 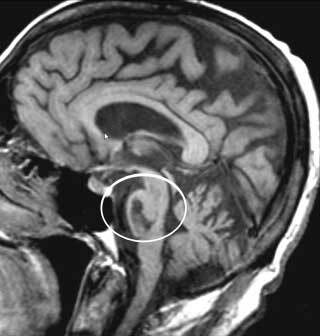 MRI scan of person with central pontine myelinolysis. Saggital view. The dark area inside the circle is the region of damage. © Timothy C. Hain, M.D. 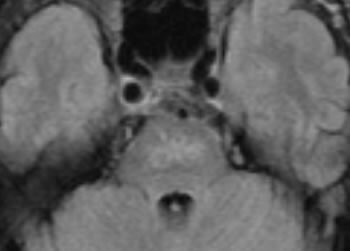 MRI scan of person with central pontine myelinolysis, axial view. Note the "I" shaped area in the center of the pons. There is a "cloud" in the central pons, in this unsteady patient with no history of a source of CPM. Imaging type is Flair. Other sources of pontine high signal include small vessel disease (Xia et al, 2017). This is more common than CPM. This shows up as a white "cloud" in the center of the pons, as shown above. 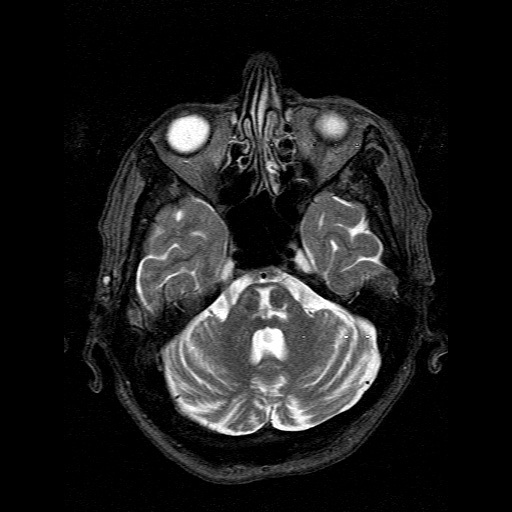 This particular patient had several vascular risk factors, including labile hypertension, and also had many white matter lesions in the cortex. We think this would be difficult to distinguish, based on MRI findings, from CPM. Kleinschmidt-Demasters (1997) followed up some of these on autopsy and found that most lesions like this are ischemic rather than due to central pontine myelinolysis. Thus the CPM diagnosis requires a cause. The "Clipper's" syndrome is another cause of white matter lesions in the pons, but these are vascular structures that light up on contrast. According to Kumar and associates (2006), central pontine myelinolysis (CPM) can be regarded as one of the demyelinating syndromes. Possible mechanisms include a hyperosmotically induced demyelination process resulting from rapid intracellular/ extracellular to intravascular water shifts producing relative glial dehydration and myelin degradation and/or oligodendroglial apoptosis. CPM is associated with the immunosuppressant agent cyclosporine, which is mainly used for transplants. Avoidance of CPM is dependent upon recognizing those patients with conditions pre-disposing them to osmotic myelinolysis and then moderating the rate of normalization of the electrolyte imbalance. Treatment after the CPM has developed is mainly supportive, but successful treatment with a variety of agents including plasmapheresis (Grimaldi et al, 2005) and TRH (Zein et al, 2006) have been reported. It is difficult to see the rationale for these treatments. Most patients recover without any special treatment. For symptoms that persist after several months, we sometimes attempt to manage them for "central dizziness", and combine physical therapy (if appropriate) use medications intended to affect the brain such as gabapentin, or 3-4 DAP. Grimaldi, D., F. Cavalleri, et al. (2005). "Plasmapheresis improves the outcome of central pontine myelinolysis." J Neurol 252(6): 734-5. Kleinschmidt-DeMasters, B. K., et al. (1997). "Asymptomatic pontine lesions found by magnetic resonance imaging: are they central pontine myelinolysis?" J Neurol Sci 149(1): 27-35. Kumar, S., M. Fowler, et al. (2006). "Central pontine myelinolysis, an update." Neurol Res 28(3): 360-6. Lampl, C. and K. Yazdi (2002). "Central pontine myelinolysis." Eur Neurol 47(1): 3-10. Yoon, B., Y. S. Shim, et al. (2008). "Central pontine and extrapontine myelinolysis after alcohol withdrawal." Alcohol Alcohol 43(6): 647-9. Xia, C., et al. (2017). "Etiology of isolated pontine infarctions: a study based on high-resolution MRI and brain small vessel disease scores." BMC Neurol 17(1): 216. Zein, E. F., S. E. Karaa, et al. (2006). "Treatment of central pontine myelinolysis with thyrotropin-releasing hormone." Presse Med 35(4 Pt 1): 618-20.